Riding a bike improves your fitness and increases your daily calorie burn, but you may not notice a significant change in your stomach area right away. Weight loss affects fat stores distributed throughout your body rather than just the extra weight in your middle. 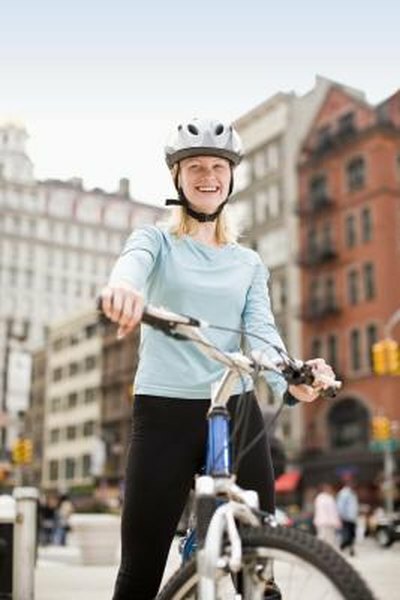 Although you can't specifically target the excess fat in your midsection, bicycling may help you achieve a leaner waistline if you take steps to promote healthy weight loss. Check with your doctor before starting a new exercise program if you have a history of heart problems or have risk factors for heart disease. While you can target specific muscle groups to train and strengthen, weight loss is more generalized. If you burn enough calories to establish a negative calorie balance, expect weight loss to occur in a variety of areas, including your stomach. As you continue to work toward a healthy body weight, track your progress by measuring your waist once a month. This way you get positive reinforcement that your hard work is making a difference. Regular aerobic exercise leads to better health and cardiovascular fitness, but the weight-management benefits of cycling depend on your creating a calorie deficit. Riding a bike only produces weight loss if you burn more calories than you consume. Consult the energy needs estimates published in the Dietary Guidelines for Americans 2010 to get a general idea of how many calories you need daily to maintain your weight. Adding cycling workouts to your routine will support gradual weight loss if you're already maintaining your weight. Modify your diet in addition to maintaining a regular exercise regimen if you typically consume more calories than you need, however. In addition to your cycling routine, consider toning your stomach with exercises that target your abs and obliques. Once you shed the layer of fat that's covering your abs, your midsection will not only be smaller but more defined as well. Although moves such as situps, bicycle crunches and trunk rotations don't directly contribute to weight loss, these exercises complement aerobic activities by helping you build a stronger, healthier, more defined physique. You need enough aerobic exercise to consistently establish a calorie deficit if you want to burn body fat and successfully trim your middle. Bicycling burns an estimated 290 to 590 calories or more, depending on your body weight and the intensity of your workout. It takes a deficit of 3,500 calories to lose 1 lb. of body weight, which amounts to roughly 12 hours of cycling at moderate intensity or six hours at vigorous intensity.